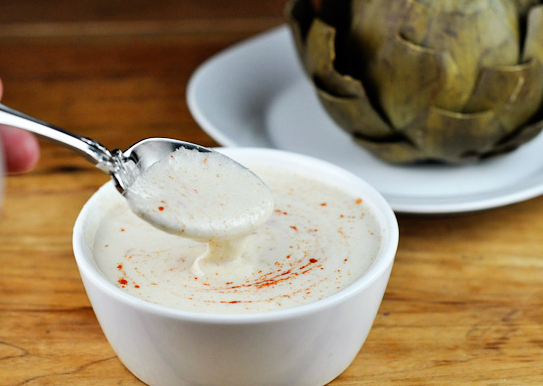 Artichokes are my favorite vegetable and this is in part because I grew up eating them with my mom’s delicious mayo, shallot and lemon sauce – a sauce that doesn’t exactly add any health factor to this beautiful, nutritious green vegetable. I’ve attempted a variation on the sauce in the past using Greek yogurt but it just wasn’t quite the addictive sauce that I grew up with. Trying my best to get back into a healthy eating routine, when I found myself craving an artichoke tonight, I decided I would pick up some vegan mayo to make the dipping sauce with. To my surprise, there was only one brand available on the shelf at Whole Foods and the list of ingredients were endless and foreign to me. I put it down and decided to try to make my own vegan mayo. Blend milk, coconut oil, cashew halves, salt and turmeric on high for 1-2 minutes until smooth and creamy. While blender is still running, slowly drizzle in the olive oil and vinegar. Continue to blend for another 1 minute until oil is nicely emulsified. Pour into a medium-sized bowl and refrigerate for 2 hours before using as a replacement to mayonnaise in just about any recipe your heart desires! This entry was posted in Recipes and tagged Almond Milk, apple cider vinegar, cashews, coconut oil, extra virgin olive oil, tumeric.